Fats, Oils, and Grease (FOG) are separated from restaurant wastewater using heat and hydrostatic pressure (water pressure). Goslyn was engineered for durability, dependability, and the utmost reliability in grease recovery. (Stainless steel construction) Goslyn will not leak or discharge grease to the drains, septic system, or sanitary sewer. 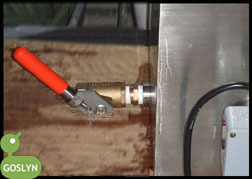 Food Solids are separated and trapped in this innovatively designed automated grease recovery device. The input and output valves control the flow of wastewater. A Goslyn Grease Interceptor will never overflow. Effluent or dishwater enters the Goslyn Grease Recovery Device. 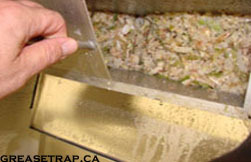 Food particles are collected in the food solids strainer basket. The strainer basket traps all food solids. The effluent passes under the first baffle plate and into the separation chambers. The food solid strainer basket was designed for quick and easy emptying. The grease separation chamber was engineered to allow the water to separate from the fats, oils, and greases (FOG) before it passes under the final baffle and over the weir to the outlet. The final weir creates a hydrostatic pressure that forces the FOG up the oil valve and into the cassette (water pressure). No skimming wheels or moving mechanical parts in this grease interceptor design. When all of the FOG has discharged, a floating ball seals the valve. When further accumulation of FOG occurs, the ball will again drop allowing the FOG to enter the oil / grease cassette. The discharged fats, oils, and grease are collected in the FOG cassette strategically connected at the front of the Goslyn. This design element allows the recovered grease to be always visible. 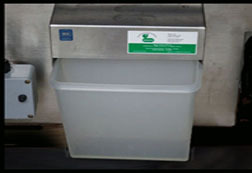 Goslyn Maintenance involves emptying the grease into the waste vegetable oil (WVO) bin when required. The recyclable waste (yellow grease) is never "Out of Site, Out of mind". No rancid odours emit from Goslyn Grease Recovery Devices. The immersion heater is a well constructed, simple heating device. The effluent or wastewater is warmed up to 104 degrees fahrenheit (40 degrees Celsius) to prevent animal fat from solidifying. Saturated fats begin to solidify at room temperature. Goslyn uses a Standard CSA Approved Electrical Plug. (110 Volt, 1000 watts, 9 Amps). 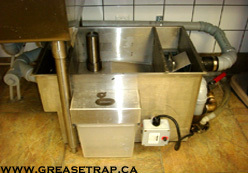 If a Goslyn Grease Trap is unplugged full grease recovery will not stop. A restaurant kitchen's temperature is or above standard room temperature. The Goslyn will not stop, I repeat will not stop recovering grease effectively. Settled silts, typically coffee grounds, are discharged through this manually controlled valve. The flush valve is another unique element of the Goslyn Grease Trap design. The flush valve discharges food solids too fine to be trapped by the strainer basket. 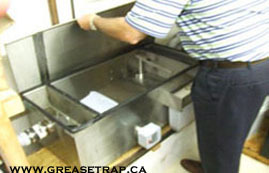 The flush valve is an innovative and unique design feature in grease trap technology. Food Solids and food particles never go down the drain. The stainless steel cover is sealed down using stainless steel clamps. An internal flow control is situated at the effluent inlet. 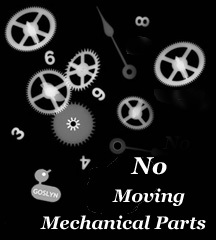 Goslyn Grease Recovery Devices do not create or store brown grease. 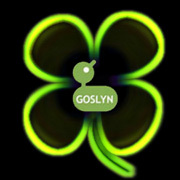 Goslyn systems remain odour free at all times. 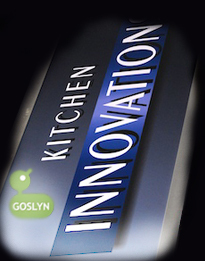 Goslyn was designed with simple operation, durable construction, and incomparable grease recovery. "Even the dishwashers like it. A no brainer "
"We have not had 1 minute of down-time. The City has stopped complaining"
"A Grease trap with simple operation. It always works for us"
"I would have never expected a grease recovery device to remain that clean after 12 months in heavy use"
"All New-Builds will have a Goslyn"